Rambler Plays Games: The Long Overdue Boardgame Challenge Update #3! 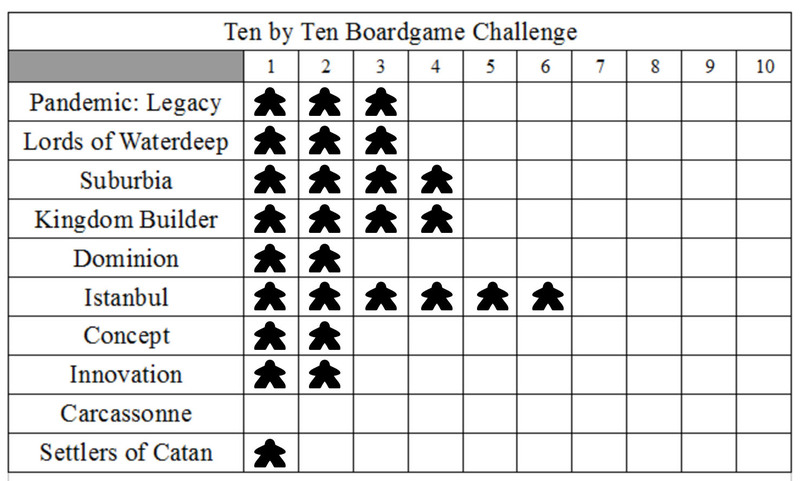 Way back in the mists of time, in an age known as January of 2017, I announced on my old blog (and then copied those posts to this blog) that I would be participating in a reading challenge and boardgaming challenge this year. I posted a couple of updates and then...didn't post any more updates. 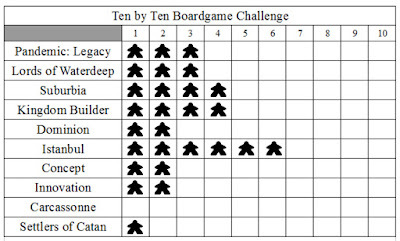 I did, however, continue to keep track of how many boardgames I've played from my 10x10 challenge list and, while I am not at all on pace to successfully complete the challenge I'm still more or less pleased with my progress. I also diligently kept track of the one book I've read since my last reading challenge update, bringing the total number of books I've read this year to three. That's way less than I'd hoped for, but it's also two more than I read last year. I'm sure I'll squeeze a few more in before the end of the year but man - there aren't enough hours in the day! A few things stand out to me about this list, starting with how awesome of a game Istanbul is! It's the only game on the list that I feel confident will see at least ten plays before the end of the year. Istanbul has easily became the favorite game in my admittedly small collection, and the fact that my wife loves it too doesn't hurt its replay value either. Aside from how many plays Istanbul has, the next surprise is how few plays Pandemic Legacy has. When I put this list together I predicted that this would be the only game that hit ten plays, and the fact that we've only played it three times is very disappointing. This is due in part to my stubborn insistence that we keep the same four player team together for every game, which has proven to be a challenge thus far. Things are looking up though, and I'm actually hoping to get another Legacy game in this weekend if everything works out. Finally, I'm realizing what a struggle it is to get some old favorites to the table. This is due almost entirely to the fact that I'd rather play my newer games. Plus it doesn't hurt that my current group of boardgaming friends are mostly new to the hobby, and already know how to play the newer games that I've taught them. So it's easier to grab Istanbul off the shelf and not have to explain anything than it is to dust of Carcassonne and explain how farmers work. That's not to say that these games won't ever hit the table (in fact I'm going to make it a point to get at least one play of everything in), but it's clear that their plays will be few and far between. I knew going in to this that, barring some sort of gaming miracle, I wasn't going to get ten plays of ten different games in this year. Still, I have a new appreciation of just how difficult of a task this is, and I'm learning a lot about what goes in to selecting what games I play. I'll be posting regular updates to this list again, and I'm looking forward to seeing what this list looks like at the end of the year!